All across Italy we have an incredible variety of bread, made with different flours, different shapes, different cooking method and so on, but for any bread the main ingradients are flour, yeast, salt and water… Well, not for the Tuscan bread, where salt is not used. In Tuscany, and part of Umbria, bread is unsalted. Is there a reason for this? Well, we think there is. The reason why Tuscan bread is unsalted appears to be historical. Back in the 12th century, Florence and Pisa were frequently at war. Florence depended on Pisa for importing salt and, apparently, Pisa sanctioned Florence with an embargo, stopping salt imports. Salt price rose so much that the Florentine people started to produce unsalted bread. Evidently, they realized that unsalted bread is not bad, because today we have the unsalted Tuscan bread not only in Florence, but in Pisa as well and in all of Tuscany, plus part of Umbria. The Tuscan tradition also counts on a lot of cold cuts of seasoned pork (ham, salami and many more) which have a very strong taste: eating this stuff with Tuscan bread is no less than perfect, because they compensate each other. As any Tuscan recipe, Tuscan bread is something very simple to do; just use good, high quality ingredients and you won’t be disappointed. *yeast quantity can be adjusted. 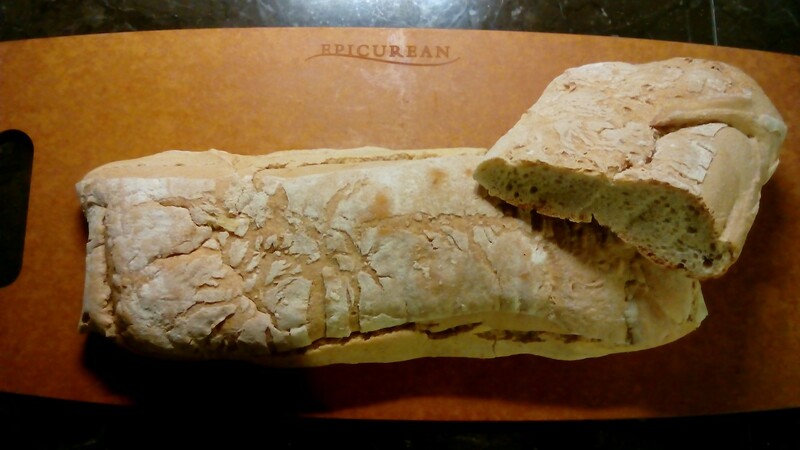 The less you use, the lighter and easier to digest your bread will be. If you can let the dough grow for 18 hours that’s best, and you can use like 10% of the suggested quantity, which is for two hours growing. Step 4: if you have a traditional wood-burning oven that’s perfect, but since not many do: turn on your oven (“static” function, no fan) at the maximum temperature allowed by your model, and cook without opening the oven for the first 20 minutes. Now lower the temperature to 350/360 °F, and continue cooking until it becomes as brown as you wish. It’s important that Tuscan bread is crusty outside and soft inside. 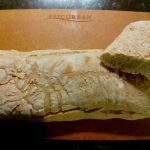 You can make Tuscan bread in any shape you prefer, even though the typical shape is the loaf, crusty outside, soft inside. A lower shape, which in turn means having more crust and less crumb, is called ciabatta. Using different flours is also something to experiment: whole wheat flour is perfectly ok, also consider that historically, the refined “0” flour was certainly not available in Tuscany, at least until the late 19th century. Tuscan bread is used, of course, to accompany some wonderful appetizers based on Tuscan cold cuts. It is also widely used in conjunction with another great product of Tuscany, Extravergine Olive Oil, to prepare the most simple yet amazing Tuscan recipe: the bruschetta (a slice of roasted Tuscan bread seasoned with oil and salt). We use stale Tuscan bread for many soup recipes, like Ribollita, Pappa al Pomodoro, Panzanella and more.